The riches still left in our earth are not easy to get to. They are often in remote areas with extreme climates, requiring a huge amount of effort and expense to get all the necessary equipment to the site, especially if it’s dangerous explosives materials and equipment. In the past, mines used packaged explosives which were better suited to bulk products. It was almost impossible to build a bulk emulsion plant during the first few months of construction. 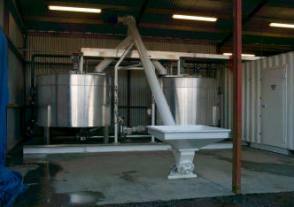 This has changed, and today with the new technology available, we are able to construct blend plants or process plants, providing high quality bulk emulsion to those remote locations. We have also developed the ability to build an ammonium nitrate emulsion production plant to facilitate a bulk product supply chain in remote areas. Process plants are manufactured specifically to the needs and specifications of each customer. The engineering team at International Explosives Equipment can work with you to produce a plant that will meet your needs – whether it’s an emulsion plant or water gel matrix. If the plant needs meltdown phases and fuel per batching, our team can assist from design through to commissioning. The plants can be built on site as a permanent facility or in our workshop as containerised modules that simply need to be placed and powered up. Plant controls can be simple manual systems or fully computer controlled. With our extensive industry experience in the complex world of explosives equipment, we are sought after from all over the world for our expertise in designing, engineering and developing blend/emulsion plants. No matter how big, small or remote your mining site is, we have an innovative solution for you. We have built plants worldwide, using some of the most highly qualified engineers and project managers who provide a hands-on service to make sure your exact requirements are met. We can also build an ammonium nitrate emulsion plant, providing all the structural, mechanical, piping, and electrical and instrumentation installation needed at your site. By using bulk emulsion explosives, you can achieve a better breakage performance for e.g. in a copper mine, it results in a decreased powder factor and a cheaper cost for the explosives. In limestone quarries an expansion of the drilling pattern also brings down the drilling cost, and the change-over to bulk explosive makes handling and storage cheaper and easier. Contact us about building your own process plant, whether it’s an emulsion or ammonium nitrate plant.